Fruits and vegetables are a wonderful way of bringing the season's bounty into the kitchen. With so much variety available suited to so many different cooking techniques there is a whole world out there just waiting to be explored. We've collated 11 lists of fruits and vegetables that will not only help you identify what fruit and veg to eat and when, but how much, how to optimise their shelf life, how to grow them and of course, how to cook them to enjoy them at their finest. So whether you're a vegetarian, a die hard Meatless Monday follower, or just an all round fruit and veg lover there's always something new to learn. 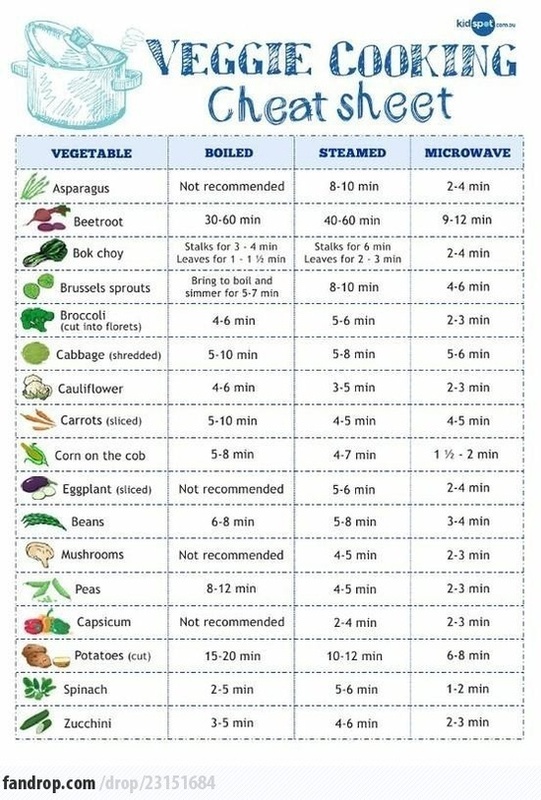 This a great one-stop guide to 45 vegetables from Cooksmarts, that covers all the basics when you're looking to use more vegetables in the kitchen. From which season is best depending on the vegetable, to how you should cook them. 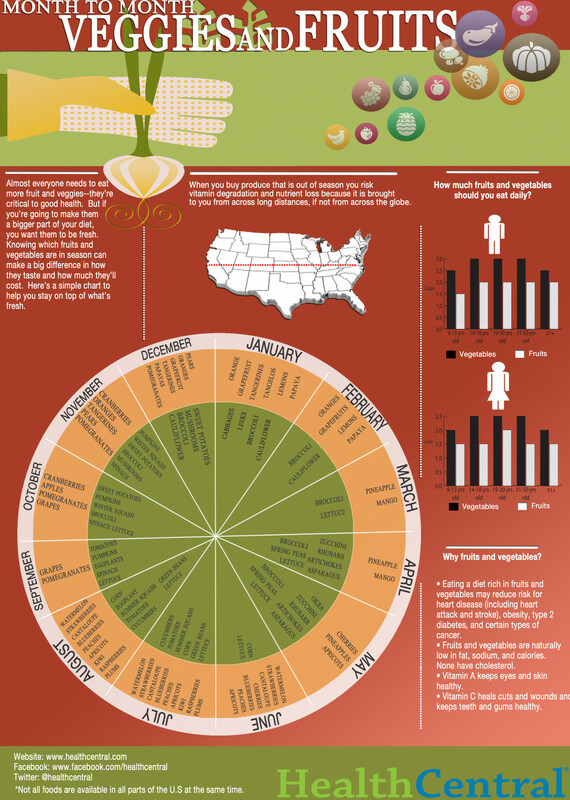 A useful guide to anyone living or visiting the US, from how to negotiate the seasons when it comes to the best fruit and veg, as well as how much you should be eating as part of a healthy diet. Ever been short changed on vegetables at the market or supermarket that are already past their best? Here's a useful guide to 33 vegetables, which should help you avoid that problem by giving some top tips on what to avoid, veg by veg. Always fancied the idea of self-sufficiency? When it comes to growing your own veg it's not so hard. Here's the cheat sheet that'll have you harvesting your own tomatoes before you can say gazpacho. We're always being told we waste too much food. Perhaps we over buy, or even reduce the shelf life of fresh produce by storing it incorrectly. This handy guide gives some basic tips on how to extend the life of vegetables, fruit and even your herbs. Say goodbye to all that extra compost. Take a look at the wonderful world of vegetables and the different families that populate it. From root vegetables to leafy vegetables, legumes and fruits. How many have you tried? Once you've grown or bought the best quality vegetables you can, you'll need to nail how to cook them to maximise flavour and retain those all important vitamins. Here's how to cook 17 of the most common veg from potatoes to peas. Ever tried grilling fresh artichokes, brussels or fennel? Here's the lowdown on how to extend your vegetable BBQ repertoire. Your vegetarian friends will love you for it. Kale gets all the press for its health credentials, but it turns out that romaine lettuce is ahead when it comes to nutrition. Here are 13 other greens that could do you just as well come smoothie time. And just when you thought you'd finished your veg, there's no need to say goodbye. Infact you can magically regrow them and enjoy the wonder of nature and more money in your pocket. Do you know your fruits from your vegetables. Here are 10 common mistakes cleared up.